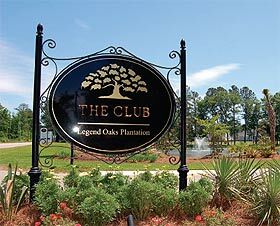 Reaching the neighborhood and golf course, down an avenue of 300-year-old live oak trees, will soon be a bit easier for residents and golfers, because roads leading to the historic plantation site are being widened to accommodate Summerville, South Carolina’s rapid growth to the south. Located on Highway 61, Legend Oaks Plantation is situated on land that was once a rice plantation. In addition to the award-winning Legend Oaks Golf & Tennis Club, it includes a family-friendly neighborhood. The nearly 1,300 families who live in Legend Oaks enjoy a large community celebration each year on July 4, including a bike parade, a 30-minute fireworks program and a buffet dinner. Numerous family-friendly programs are available, such as the Legend Oaks swim team, Junior Little Legends instructional programs, Friday night team trivia and the ever-popular Road Rally Series, which offers a teamoriented trivia competition for people of all ages. Education also is important to residents of Legend Oaks. Three stages of residential development have evolved over the past decade, with the golf course and tennis courts at their center. Legend Oaks Golf & Tennis Club boasts a brand new 2011 cart fleet, with each equipped with a state-of-the-art GPS distance management device. “We are one of only two courses in the Charleston market to offer GPS,” said Chickarello. He pointed out that the small, tablet-like device is mounted on the cart between the driver and passenger and offers a picture of the current hole, sand traps and water hazards. It even provides communication between the clubhouse and golfers, just in case inclement weather threatens. The course itself has garnered many accolades, including 2010 Golf Course of the Year by the South Carolina Golf Course Owners Association; 2009 Best Course in Summerville, by the readers of the Summerville Journal Scene; 2006 and 2007 Top 100 Golf Courses in the Carolinas by Carolinas Golf magazine; and Top Three Lowcountry Course in 2004, selected by readers of the Charleston Regional Business Journal. After a day of fun on the golf course, or maybe before the day begins, members can relax and enjoy the classic Southern style clubhouse, which serves breakfast, lunch and dinner. Legend Oaks is located adjacent to the massive MeadWestvaco East Edisto development, which, over the next several decades, will bring thousands of new families to the greater Summerville community.